We've seen all kinds of strange segulos being marketed, from silver rings of power to witchcraft charms of ruta sprigs and pouring lead to eating pulverized pig's testicles. 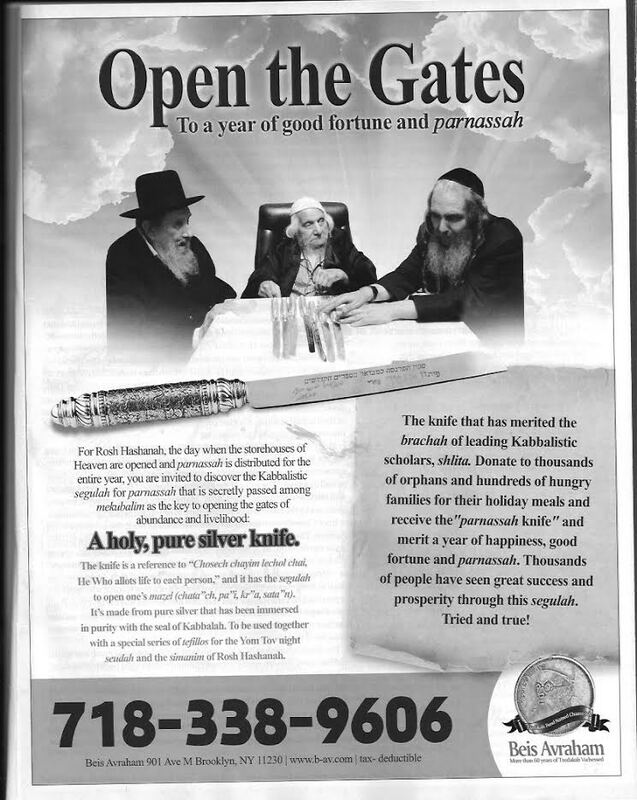 The latest high-profile offering, taking up a full-page advertisement in Mishpacha magazine, is a silver knife. "Immersed in purity with the seal of Kabbalah," this wondrous blade has allegedly been proven to bring "success and prosperity" to "thousands of people." While until now this silver blade has been "secretly passed among mekubalim," it is now being released for the good of the general public - in exchange for a suitable donation to a charity that helps the poor. Personally, I'm not sure why this "secret tradition" has only been released now - why did they wait so long to solve the problem of poverty? Furthermore, if they want to help the poor, isn't it more effective to give them silver segulah knives? At least the profits from this are going to a worthy charity rather than to someone's pocket or to perpetuating the kollel disaster. But we have yet another manipulative shtick that promises salvation in exchange for an expensive placebo. Marty Bluke at The Jewish Worker, who brought this to my attention, laments that Mishpachah is too frum to print a picture of a woman but is willing to print this nonsense. Yet while I detest much of what is printed in Mishpachah, overall I do rate it as a positive influence. And they do have to somewhat accommodate the likes and dislikes of both their readership and the powerbrokers in charedi society, or else they would not be able to be effective. Thus, I do not think that this advertisement is necessarily cause to criticize Mishpachah. Instead, I think that this advertisement, especially in light of the recent brouhaha over women's pictures, is revealing of a disturbing weakness in charedi society. Printing pictures of women is considered to be so dangerous in its risks of leading people astray that there is a blanket ban on it. But printing all kinds of advertisements that seek to take people's money by offering false promises of financial or marital salvation is not considered to be dangerous and may not be questioned. We are approaching Rosh HaShanah. We will declare that good deeds are what we should be striving to put under our belt - not silver swords. Because if a man cannot work in order to make money, or get an education in order to qualify for more remunerative work, he can still purchase a magic spell. With all due respect to the author, I'd like to suggest a paper I've seen recently, providing clear and comprehensive (and dare I say, more balanced in my opinion) summary of the views of various Rishonim on the line between superstition and Segula. That's not an actual download link. Looking at the website, it's clearly very strongly aligned with Chabad doctrine. It probably is linked to Chabad. I guess my view of 'balanced' is further right than yours. It's not going to be an honest analysis, because from the outset they are committed to backing up whatever the Rebbe's approach was. I haven't done thorough research or a survey on segulos that the Rebbe suggested, but he wrote numerous times in Igros that "the best segulah is increasing in Torah and mitzvos". One segulah that is widespread in Chabad is trying to do/purchase פתיחת הארון when one's wife is expecting, after the fifth month of pregnancy. It is a segulah from the Chidah, for easy childbirth. The Rebbe didn't dissuade people from doing it--he just said that people should try to do it in a way that it's not so conspicuous "why are they always trying to do פתיחת הארון". @Yehuda: granted, Chabad puts very little focus on Segulos, and places them in proper perspective. however that has less to do with lack of faith and more to do with תמים תהיה. מי לנו גדול than the Rashba quoted by our esteemed host to support מנהג נשים זקנות. @Natan: It should come as no surprise to you that there are many in Chabad who are familiar with Rishonim, Achronim etc. on topics on which the Rebbe did not comment. As far as 'honest' analysis is concerned, my wording was actually 'balanced' as in, inquisitiveness balanced by the (faith) possibility that Torah might actually be eternal. I don't know about this organization's web site. 1. It has a picture of a pre teen and her mother, both in sleeveless top. 2. The tab for 'transparency' (at least it has one. Never saw such an option) doesn't work. You mean www.b-av.com? Yes, the website is a little unusual. But it seems to be a worthy cause. Does anyone know anything about this organization? No tax return. No financials. No name of principals. This nonsense and everything like it must stop. Please consider the damage that you are doing to the emunah of Klal Yisrael. @Tom Voletz: My chevrusa and I came upon a citation of the Gemara (Baba Basra, 91a) which mentions the names of the mothers of Avraham Avinu, David HaMelech, Shimshon, and even Haman. The Gemara asks, "למאי נפקא מינה?" The Gemara answers: לתשובת המינים--to answer people who might question the strength of our Oral Tradition. I immediately thought of your letter. Excellent letter. Apparently, to paraphrase Maimonides, the editors at Mishpacha will "accept the ad money from wherever it comes," as long as the advertisers look "frum." FYI, the asking price for the magic knife is $480 - in monthly payments of $40 over a year. I am shocked and disheartened by all the hemming and hawing over segulot by otherwise thoughtful people. The "kabbalists" who peddle segulot are like the emperor whom everyone is scared to call naked. Why is it so hard to tell the truth about this? That vulnerable, desperate people are being fleeced by con men (and women - there is a healthy egalitarianism among this set)? Psychics are currently serving jail time for fraud (see recent NYT article). I give them credit for at least not invoking religion as they serve up their fraud. Why does the group of people that are officially so intent on 'following the ways of the Torah' endorsing pagan practices? Isn't carrying a dagger a Sikh religious practice? Hi there! Yes, I believe it is called a kirpan. Sikhs (men and women) must carry a bladed weapon to be ready to defend the innocent. In practice it's usually a small, mostly useless knife, presumably to minimize security hassles. I'm reminded of a story I once read about a talmid who saw his rebbe cut his nails after emerging from the mikvah, instead of beforehand. When asked why, the rebbe said it was a great kabbalistic secret which could not be given over until his student spent years learning Torah and perfecting his middos. The student happily accepted the challenge. After many years had passed, the rebbe saw that his student indeed became great in Torah and middos and was thus able to understand the great secret: Nails are easier to cut when they're wet! I would hope that the people who made this advertisement know better, and are just trying to light a fire under superstitious and gullible Jews who wouldn't otherwise donate to the poor. It is still highly not recommended for all the reasons Tom Voletz posted, and probably many more. My preferred segulah when donating to tzedaka is an ancient Chinese kabbalistic ritual whereby one is entered into a holy consecration with other ba'alei tzedaka, and, like the Cohanim vying to perform the avodah, a lottery is used to determine who is worthy to receive a set of holy Tumi luggage. Tumi's formula of 100% ballistic nylon is well known to secret kabbalists as enabling the utmost fulfillment of "uvilechticha baderech." "While until know this silver blade has been "secretly passed among mekubalim". Only those in the know this is foolishness. That is the kabbalistic secret. The rest can pay $480. By the way, is silver strong enough to cut something evenly? And how much silver do you get for $480? How much steel is added? Or does it come mass produced in india? The knife brings success and prosperity to those who sell it. There are many Orthodox Jews who did and still do fall into the magic spell - magic amulet camp. Many also believe there are certain individuals/Rabbis who have special secret knowledge - as if these individuals have special communication with the supernatural. Once a person believes in supernatural things there are many different paths that become available. Isn't belief in Hashem belief in the Supernatural? Do we actually know how many people purchase this thing? For all we know, only three or so people fall for it. In which case the criticism of the Chareidi community is completely unwarranted. As for Mishpacha, business is business. In the last century people went around (supposedly) selling the Brooklyn Bridge or Tower Bridge. Can we therefore assume that all tourists are incredibly gullible and stupid. And from time to time an ad pops up selling land on the moon in various newspapers. Can we assume therefore that all readers of that newspaper are stupid and gullible? Of course not. Unless you can show that Chareidim go out and purchase this knife in droves, your conclusion is unscientific. the criticism is not of charedim, you are correct that hardly any one falls for this nonsense. the criticism is of the magazine that carried the advertisement. it was indeed a failure of oversight on their part, hopefully now that it has been pointed out to them, they will be more careful in the future. Ads cost money. Clearly somebody falls for this stuff because we keep seeing new ads for it. Same people who fall for the other 'segulot'. So it seems the concept of a new knife before the Chag has a source in Hasidic tradition (of course still a 'non-rational' segulah, but makes sense within that system). However the whole silver aspect just seems like a way to charge a ridiculous amount of money, and also to mislead people that in order to do this segulah they need to purchase this 'special knife' which is only available from them. The general idea of doing symbolic acts before/on Rosh Hashana isn't so far out from normative tradition since of course we have the simanim (although there may be more rational-psychological ways to interpret that practice), but these guys are obviously taking this way too far. Watch it effortlessly cut this ripe tomato into paper thin-slices. NOW what would you pay!! But they give you a freebie knife. I want to know if it cuts sharp cheese and onions. A while back, we got a solicitation from a yeshiva which promised that, thanks to the tefilot of their tinokei bais rabonom it purchased, we would be guaranteed safety from traffic accidents. In line with the idea of distributing segulah knives to the poor, I wrote back a suggestion that they have their bochrim daven on behalf of the entire US. Surely it would reduce traffic fatalities to zero. Imagine the kiddush Hashem! Between believing in a magic knife, and believing in the power of Holy Men, is there that much of a difference? And yet belief in the latter goes back all the way to Tanach. The first King of Israel himself consulted with fortune tellers. It may be nonsense, but if so, its nonsense with a pedigree, and that makes all the difference. As for Mishpacha - you seem to go out of your way to excuse a lot of what you find objectionable, on the justification that its better than nothing and they have to appeal to their core audience. Interesting. Perhaps this is just a justification to yourself why you don't want to criticize them. For you can use that logic to defend pretty much anything. Um, yes, he consulted with a necromancer. (Not a "fortune teller", and not plural.) And he was very, very much criticized for doing so. In fact, he died the very next day. But the point is, he did it. Regardless of the later criticism. (And as you well know, the death the next day was not a result of having visited the witch.) Moreover, he not only visited the witch, he also earlier went along with his servant's plan to find the missing donkeys by consulting with a Holy Man. Point is, belief in non-rational beliefs have been around a loooooong time. While this is silly, I think that the whole anti-vax thing is a lot more important to deal with. Part of it may stem from the same source - the trend of focusing on segulos and mysticism and not taking scientific / rationalistic arguments seriously,and thereby having no problem ignoring the basically conclusive proofs in favor of vaccination. I don't have statistics to back it up, but there seems to be an increasing interest in alternative medicine, holistic approach etc which corresponds to the timing of the recent segulah phenomenon. So the whole vaccination issue might just be one of many outcomes of that underlying approach. Besides all the pitfalls of post hoc reasoning, is the segulah phenomena recent? Moreover, I would argue that the anti-vax issue is easier to deal with first. It is easier to "disprove" given all the time and effort studying vaccines and there are a lot of Orthodox of all stripe who will oppose the anti-vax due to safety reasons. If the anti-vax can be discredited, then people (if you are right that there is an association) might be less inclined to be believe segulot from the same sources. I'm with you David. The recent letter from prominent Rashei Yeshiva not allowing Yeshivot in Lakewood to require that children be vaccinated in order to attend their schools, with its false and misleading anti-vaccination rhetoric, is a much more dangerous, important, and pressing issue, and I am surprised that R. Slifkin has not yet addressed it. Some of these rashei yeshiva came out against segulot a few years back. Very troubling, but perhaps consistent, that they have dug in their heels to support MBP and allow anti-vax -- both of which endanger minors -- while opposing segulot. I am surprised that R. Slifkin has not yet addressed it. Don't you remember that with founding of the Museum, he said that he would not have the time or inclination for blogging on controversial topics any more ;). I have a whole essay written in my head on the irony of the Lakewood Anti-vax "Daas Torah" letter. But I really wanted to see the accompanying "responsa" referred to in the letter, and I was not able to find them online. @David S. Zinberg: Some of these rashei yeshiva came out against segulot a few years back. Very troubling, but perhaps consistent, that they have dug in their heels to support MBP and allow anti-vax -- both of which endanger minors -- while opposing segulot. I'm not grasping your point. If the anti-vax Rabbis are also anti-segulah, then focusing on segulot is certainly a waste of time. David: I hope you will write it. It seems to me that since this ad promises performance in exchange for payment, this is a case of criminal fraud. Any lawyers in the house? Non specific promise of non specific financial gain to non specific people. A very beloved personality in Kfar Chabad recently passed away: Mr. Velvel Marantz. He was a music teacher, and composed children's songs to instill in them love of the mitzvos, etc. Once he wrote a song about tzedakah. The lines went something like, "And for all your trouble/Your cash will come back double." Someone said that it might be considered misleading: the children might give tzedakah, and not see that they get anything back. So he changed the lyrics: "And for all your trouble/Your cash may come back double". He said, "It may also come back triple!" My father-in-law's shul in Long Beach had a bunch of flyers advertising that for whatever sum you could have 'all the gedolei hador' davening for you at the kotel (really should have taken a pic). Leaving aside the argument of who they might be and whether such a thing would ever work, the idea is preposterous on its face yet not a single person in that modern orthodox community thought to just pick them up and throw them away....there's an unthinking Jewish tendency to respect anything printed, no matter how absurd. "But printing all kinds of advertisements that seek to take people's money by offering false promises of financial or marital salvation is not considered to be dangerous and may not be questioned." Not to mention the little detail of tempting people to violate an issur d'orayta we read about only a couple of weeks ago. I'm presuming they wouldn't accept advertisements for a adultery website, a hitman or an idol manufacturer, but I'm struggling to find the difference. An issur d'orayta is an issur d'orayta. Let's be honest. 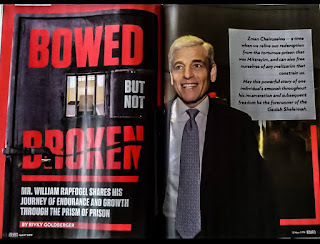 Mishpacha is supposed to be a frum magazine. And yet, it has no issue taking money from an organization trying to sell a holy knife to desperate believers. What does that say about the values of its editors? Do they have no shame? As I read it, there must be a whole supply of knives available because it didn't say anything about one knife for the first to come or the biggest donor. That made me come to believe that this is just plain old medicine-show fraud. Also, I could not find any information about the supposed organization on guidestar. The address seems to be a crummy two-family house.